The Four Oaks is one of the largest seafront Hotels in Llandudno, located on the beautiful north west region of North Wales . This popular Hotel in the heat of Llandudno is situated right on the seafront near 'Venue Cymru' and just a short walk down the promenade to the town centre. We pride ourselves on a warm welcome and 'nothing being too much trouble' when it comes to the comfort of our guests. Entry to the hotel is flat, with no steps, and there are also three rooms on the ground floor. There is also disabled access to the hotel. Llandudno is located just 45 mins from Chester, 20 mins from Rhyl, and just over 1 hour to the M6. The hotel is a convenient base for exploring Llandudno and North Wales, read more about the area on our dedicated page. For those that do wish to get out and about and explore the gorgeous North Wales Countryside and local towns. We are just a 45 min drive to Snowdon, 40 min drive to Caernarfon and a 25 min drive to Bangor. We also have a free car park and coach park. 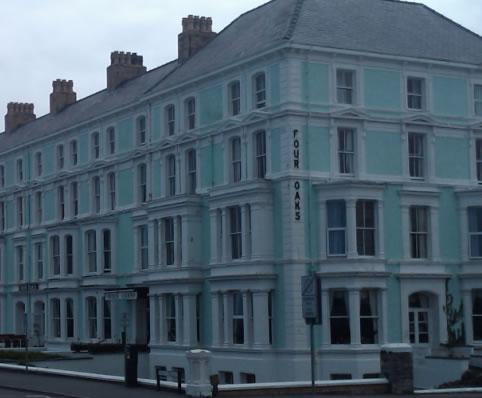 The Four Oaks Hotel Llandudno is open all year round. 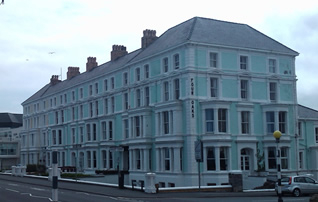 Four Oaks Hotel in Llandudno is the perfect location for any visitor to Llandudno. Whether you want to enjoy the North Wales area for its adventourous activities, or simply want to chill out in Llandudno amongst its spectacular scenery, you can do it all knowing Four Oaks have a comfortable bed and a delicious hot meal waiting for you at the end of it all.